Correcting the shape and size of the deformed hood includes two basic operations: pre-edit for the relief of shock and the final levelling of fine roughness. Special levers and clamps to repair dents, chisel, wooden mallet, or hammer with a rubber or plastic strikers, support anvils, straightening a saw. Gas burner (if available). Remove the hood from the vehicle. This is necessary for ease of operation. To do this, disconnect the lock from the bracket and Unscrew the mounting nuts of the hood. Before proceeding to remove the paint from the front side, anti-corrosion and insulation coating on the inner side of the hood. To start the repair should with surfaces having a higher rigidity: pleats, ribs, amplifiers, breaklines. Peening must frequent light blows with a small metal hood. To evaluate the quality of editing and alignment must visually or quick stroking surface with the palm of the hand in the glove. Convex and concave surfaces are inspected visually, when you look at an angle or from the side. Flat surfaces are controlled with a ruler. Note that the breaklines are focusing the maximum internal stresses, which prevents the shape recovery of the hood. Shallow and small dent recommended rule applying disparate blows to the top of the dent. Extensive dent - leveling gradually, starting from the edge of the crest. The blows should be light, frequent, in the direction from the periphery of the dent to the center. Under the surface at the border of the dent should be support support with the most suitable curvature of the surface. To remove the dent is obtained by heating and shrinkage of the metal, if in the presence of a gas burner. 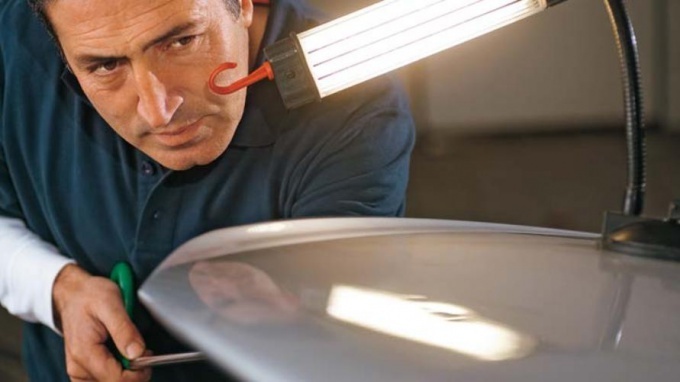 This method is suitable for removing dents with a significant hood metal. For this purpose, space heating should remove paint and anti-corrosion coating, put the wet rag around the heated space. The metal to be heated in point of size 8-10 mm to cherry red and cooling with a wet rag. A greater effect can be achieved in combination with light hammer blows. The number and location of points of heating is determined by the shape of the dent. Apply straightening in combination with heating only in the presence of practical experience in performing this surgery. Rule the hood in a remote place should be with hammers, plates and specialized levers. The choice of lever depends on the location and nature of the dent. For example, to eliminate dents under the amplifiers need to apply the flat levers. Restore prostanovka and ribs to made using chisel and the base plate. To bring the hood before painting only after careful straightening. Small cracks to eliminate applying the polyester filler with the subsequent processing of straightening the saw. Alternatively, apply solder, and then eliminate the weld straightening the saw. It is unacceptable to remove minor imperfections by removing layers of metal using straightening saws. To perform the work with proper quality. Form the front surface of the repaired hood must conform to the shape and geometry of the new. The clearances of the hood with the adjacent body panels must be of appropriate size and the same perimeter. Cracks, holes, metal sealed, corrosion removed, welding seams flush with the metal. The thickness of the layer of polyester putty after processing should not exceed 2 mm. hood Lock should be adjusted if after the repair it does not lock or unlock properly. Install the hood on the car need after applying the paint, anti-corrosive and anti-noise coating that was removed before starting work. Repair the hood often unfavorable. Cheaper to replace with new. Therefore, before the repair should be to assess and compare the cost of repair, and replacement of the hood. Work surfaces mallets, hammers and anvils should be as smooth (polished).